Though I like all my snakes Jade here is my favorite... easily understandable since she's also the first milk snake I had. She'll be 10years old this coming October. I'm not as hopeful she'll one day break the record for size as I once was but without trying to get each and every kink out of her she measures 6'-5"... we still have a lot of years ahead of us so who knows. She's never given up her habit of chilling out in the open... makes getting pictures easy! 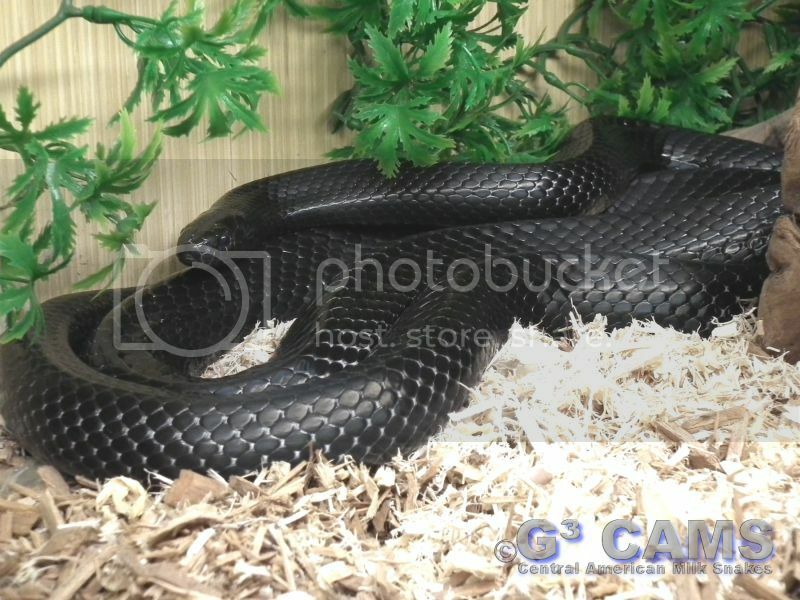 Looking back at the last post concerning Black Milk Snakes I can safely say she's completely black. Up until she was about 6 years old I could make out the slightest hint of bands on the subcaudals... just a tiny difference in the slate grey color... today there is nothing, just a uniform slate grey. Anyway that's my prized little beauty... as always thanks for her Nathan.